Geek Steal: Family Guy - The Complete Collection for 65% off! Geek Steal: Family Guy – The Complete Collection for 65% off! I don’t want to overwhelm you with these “geek steals” this week. I mean, I know how most of you prefer to pay full price for all of your purchases, in service to your country and its flailing economy. Which is perfectly respectable of you. Cheers. But for the rest of you who, oh, I don’t know… enjoy saving money and stuff: For today only, Amazon has the Family Guy – The Complete Collection DVD set on sale for $59.99, which is $62 off of yesterday’s price of $121.99, and 65% off the list price of $169.98. That’s 22 discs with over 100 episodes, loads of special features, plus Family Guy Presents: Stewie Griffin – The Untold Story and Family Guy: Blue Harvest. 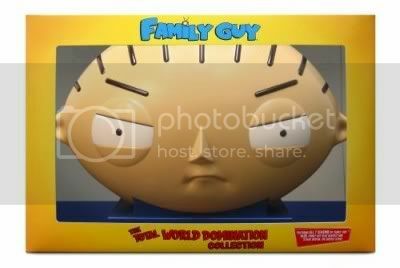 But obviously, the true pride of ownership of this collection comes from the packaging, which features a limited edition, collectible “Stewie Head” that’s available only on Amazon.com. Thanksgiving table centerpiece, anyone? Buy the DVD set here. My thanksgiving centerpiece is going to be a basket full of kittens. Diane’s deathly allergic to cats, but we both agree that it would be the best thing ever. Geek Steal: 64% off the Complete Series of Deadwood! Geek Steal: Today Only – Heroes Season 1 for 50% off!